DURABAK™ is a tough, single-pack, totally flexible, slip-resistant, waterproof protective polyurethane coating with self-contained recycled rubber granules for an attractive tough-textured finish. When exposed to atmospheric moisture, DURABAK™ undergoes a chemical curing process which changes it from a liquid to a tough polyurethane membrane. It has excellent abrasion and chemical resistance. It is also available in a smooth version without the rubber granules. Both DURABAK™ (aromatic version) and DURABAK 18™ (aliphatic version) may be used for indoor and outdoor applications. However, as DURABAK™ may experience some degree of fade in outdoor applications, DURABAK 18™ is recommended for maximum UV protection under these conditions. For enhanced UV protection, DURABAK™ may be topcoated with COTE-L'S rejuvenator. Call COTE-L Industries for more information. DURABAK™ will chemically bond to most clean and dry surfaces. These include, but are not limited to, concrete, wood, fiberglass, metal, rubber and sound-painted materials. Some metal and extremely porous surfaces may need to be primed. DURABAK™ can be applied by roller, brush or spray. DURABAK™ can give a relatively smooth or rough surface, depending on application technique. A complete Material Safety Data Sheet is available on request. 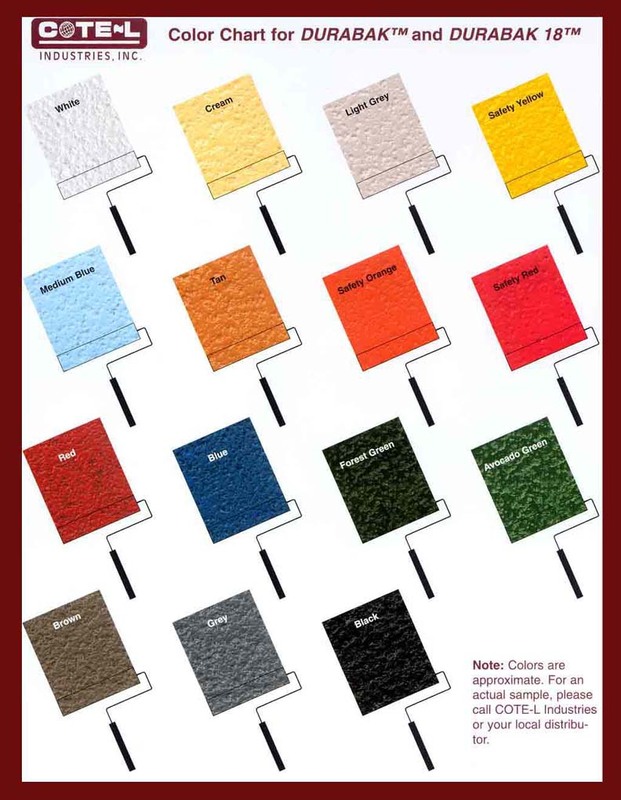 DURABAK™ comes in standard and custom colors, including Black, Dark Grey, Light Grey, Brick Red, Safety Red, Dark Blue, Medium Blue, Forest Green, Avocado Green, Safety Yellow, Safety Orange, White, Tan, Cream and Clear (without pigment or rubber granules). All colors also available in smooth version (without granules). Color matching on volume orders.